Tremors, or Just an Optical Illusion? I am now fairly certain why Stephen C. Carlson saw all signs of forgery in the handwriting of Clement's letter to Theodoros. It seems all to be due to the basis of his work; printed low resolution images from Clement of Alexandria and a Secret Gospel of Mark by Morton Smith. In 2005 Stephen C. Carlson came out with The Gospel Hoax: Morton Smith’s invention of Secret Mark. As the title says, Carlson argued that Morton Smith in fact invented Clement's letter to Theodoros containing extracts from a so-called Secret Gospel of Mark. Among the several indications for this presented by Carlson, he also pointed to the actual writing. We only have photographs of a now lost copy of the letter. This shows a text that appears to be written in a hurried cursive eighteenth century Greek handwriting. 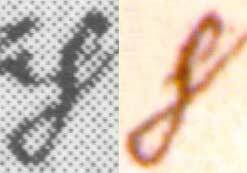 Carlson thinks that “it should be possible to tell if the hurried handwriting of Theodore is natural or simulated.” (Carlson p. 27) He suspects that if Morton Smith forged that handwriting in the twentieth century, imitating a hurried cursive eighteenth century handwriting, he would have had to write much more slowly in order to form the letters in a way which was not typical for his own way of writing. This careful imitation where the letters are almost drawn would, according to Carlson, lead to a number of characteristics which could reveal the counterfeiter (and according to Carlson, this counterfeiter, or hoaxer, was Morton Smith). Carlson also claims to have found signs revealing this slow imitating. He refers to a number of “[b]lunt ends at the beginnings and ends of the lines” of the letters. This would be the effect of a very slow shaping of the letters and that the pen thereby came to a stop and the ink would accumulate. He also finds many instances where the pen was lifted in the middle of a stroke and this would indicate that Smith needed to prepare himself for writing the next letter before continuing. Occasionally Smith still had to go back and retouch certain letters. Further Carlson sees a lot of tremors in the writing, tremors which reasonably would not occur if a skilled scribe would have written the letter in a fast pace. Accordingly the tremors are also an effect of slow writing. When I previously evaluated Carlson’s claims in the article Reclaiming Clement's Letter to Theodoros – An Examination of Carlson’s Handwriting Analysis, I had a tough job in extracting all the letters for comparison. When I later systemized them and then also could evaluate Carlson’s assertions, I was often surprised to see that I could not find the signs that he referred to. I realize now, that I sought to find them in places where they were not. What I did not do, and of course should have done, was to compare my colour images, which were scanned in 1200 dpi directly from the colour photos taken by Kallistos Dourvas in the late 70s, to the images Carlson used, which he took from the printed images in Morton Smith’s book showing the black and white (b/w) photos Smith took in 1958. I did at that time however, not have access to Morton Smith’s Clement of Alexandria and a Secret Gospel of Mark. Now that I have got hold of the book, and have scanned also these images in 1200 dpi, I realise that the low resolution prints, done on a printing press in the early 70s, have a line screen at a 45 degrees angle. I had of course noticed this before and I had also previously been updated by Scott G. Brown, who informed me of this in an e-mail. Further, also Walter M. Shandruk in a blog post named Carlson’s Handwriting Analysis on Secret Mark, noticed how pixelated the letters were. But the images he presents do not seem to fully show all the details. A line screen can be described as lines made out of separate dots of different sizes, yet organised in straight lines separated by the same distance and reproduced at a fixed angle. In this case the angle is 45 degrees. 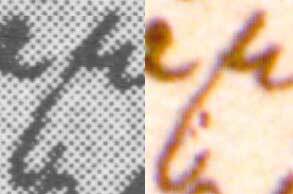 As can be seen from the enlarged image to the right, which is scanned from the printed black and white images of the letter found in Smith’s book, the dots are arranged very symmetric. When you are printing, as in this case in black and white, there is only one colour, and that colour is black. There will either be a black dot, or nothing at all, just the background colour of the paper, which normally is whitish. If you wish to produce different shades of grey, you still only have black dots at your disposal. You fool the eye into believing that the image is grey when viewed at a normal viewing distance, by letting white and black areas interact with each other. The more black dots or the larger the dots are, the darker the area appears to be, and of course, the fewer black dots, the lighter the area appears. The area to the right is simply a grey background area of the letter enlarged so that the dots can be seen by the naked eye. In normal magnification the area will appear just grey, as is illustrated by the same magnified area reduces into the small grey rectangle in the lower right corner of the image. When you print for instance letters, these letters are also made up of similar dots. 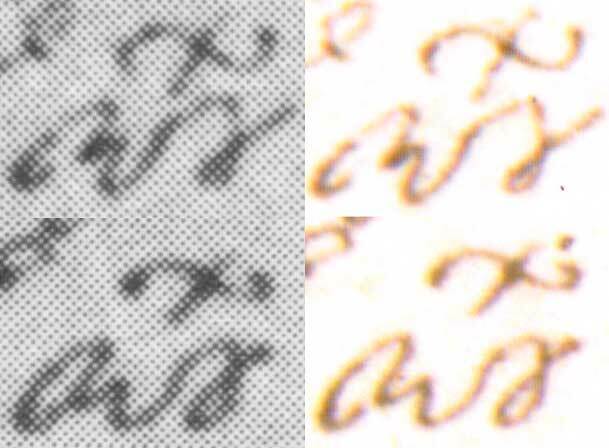 However, because of the low resolution reproductions in the book, the letters will not appear smooth in high magnification. This is due to the low resolution line screen. 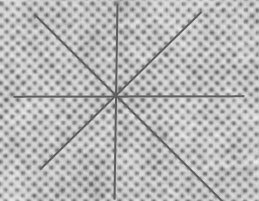 When you enlarge a halftone image very much, like the one printed in Smith's book, you will not see an accurate representation of lines that are not both perfectly straight and at an angle that accords with the screen. Since the dots are arranged in straight lines with the same distance between them, you can produce straight lines only horizontally, vertically or at 45/135 degrees angles (as the screen in this case is in 45 degrees angle). This is illustrated in the figure to the right. Whenever you reproduce a line at a different angle, it will appear stepped and this could easily be mistaken for a hesitation in drawing the letter. 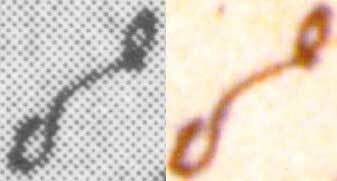 Since Carlson must have looked at images similar to the ones I shall reproduce below, I claim that the reason he saw all these signs of forgery is not due to the fact that there are any such signs, but due the poor images he used, in which the letters appear to be stepped, but in reality are not. I will not, like I did in my previous article, make a full survey of all the examples Carlson refers to. I will settle for including about half of his examples, showing the most obvious within each category, in order to demonstrate how and why Carlson saw what he saw. Nor will I refer to from where the letters are taken, since this information is given in my previous article Reclaiming Clement's Letter to Theodoros – An Examination of Carlson’s Handwriting Analysis. Those who wish to know this will have to go there. Carlson sees “blunt ends at the beginnings and ends of the lines”. This he says indicates “that the strokes were written so slowly that the pen had come to a complete stop at the ends of the strokes.” The black and white images I present here, reasonably represent what Carlson saw. To the right there is the sign of the cross, which in the b/w image has a massive ending at the bottom, while the colour image shows fading colour at the ends. 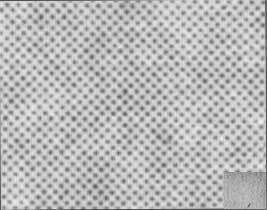 When these low resolution b/w images are magnified to this size the shading at the ends of the letters cannot be shown, as they are constructed of just a few large dots. All shades between black and white are missing. Next is this tau. Also this time the faded endings cannot be reproduced in the b/w image, leading to a large blob at the bottom, when in fact there are two intersecting lines seen in the colour image. 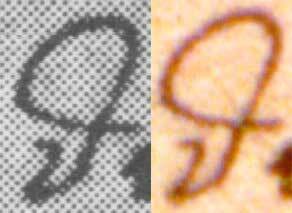 The blob that Carlson sees below the top loop in this tau is also a consequence of the halftone process. After that we come to this iota, where we in the colour image can see that there is a hook upwards to the left, while the b/w image only shows a big blob. This is in all likelihood the “ink blob“ that Carlson saw. The circles below show the ending enlarged and how impossible it is to render small details with a faded surrounding in the b/w images which Carlson used. Carlson finds another ink blob betraying hesitation at the beginning of this upsilon. That is at the beginning of the letter down to the left. Looking at the colour image, this letter do seems quite ugly, an example of poor penmanship which could be mistaken as a sign of forgery. The line thickness at the beginning of this stroke looks though more regular in the colour image than in the b/w one. Finally we have this sigma where the “ink blobs” look more prominent in the b/w image than they do in the colour image. Carlson claims that on several occasions, where a skilled scribe would have written in one stroke, this scribe stops, lifts the pen and begins anew. I leave aside the example Carlson gives for of a pen lift between epsilon and kappa, where there certainly is a pen lift, but where this scribe always lifts his pen as he never connects the letter kappa to the preceding letter. For the rest, there are obvious examples where the 45 degree angle of the screen contorts the line, creating the illusion of hesitation, retakes, or unnatural shifts in direction. In for instance this stroke between the omicron-upsilon ligature and the circumflex accent, Carlson sees a pen lift. That is on the middle of the long diagonal line, which also is enlarged in the circle. On the colour image one can clearly see that this line is drawn in one stroke, yet in a curve which is a characteristic of this scribe when he writes this letter. However, in the b/w image the curve appears as if there is a break in the line and one or two retakes beginning beside/below/above the line. Now, this is a consequence of the line screen not being able to reproduce the curve, and instead beginning on another line of dots along the 45 degrees angle, in order to follow the letter’s curve. Another example where Carlson spots a pen lift, is between this alpha and this tau. In my previous study (3.5), I assumed this to be at the connection at the left top of the tau, where there is a slightly darker area which can be seen in the colour photo, and as I did not find any other obvious signs of a pen lift. However, in the b/w image there are signs of a pen lift in the bottom of the curved line which is cut out and enlarged into the ellipse below. As the lines of dots along the 45 degrees angle continues downwards, it actually looks like a break and a retake at the spot where the arrow points. The same curve appears to be smooth and written in one stroke in the colour image. 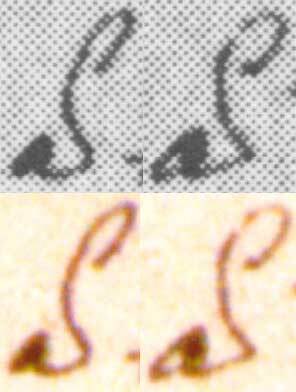 The bend is however impossible to reproduce smooth in the b/w image and therefore it looks like the scribe stopped and then began a little further to the right. Next we have this lambda, where Carlson sees “[u]nnatural pen lifts in the middle of what should be” a smooth curve in the left leg. This was one of the examples where I in my previous evaluation was unable to see where Carlson saw the pen lift. Now I realize that he must have taken the broken line on the leg down to the left for a retake, while in reality the appearance is solely due to the fact that in order to follow the line, which is done in perhaps a 35 degrees angle (and also gets narrower and then wider), the dots have to shift position as they are following the 45 degrees angle. This break can only be seen in the b/w image, and it is enlarged in the circle for a better view. This also explains why in my previous study, where I used the same colour images as presented here, I could not find any retake. All of these examples show that when lines are produced at angles which differ markedly from the angles possible to reproduce correctly, the lines will be stepped and it will appear as if the pen was lifted and a new stroke was done beginning on a different level. This holds true also for the next example, where Carlson finds a pen lift between the epsilon and gamma. The actual place where the break appears, is cut out and enlarged in this ellipse. It really looks like the epsilon is done separately and the gamma is connected a little bit above the epsilon. As can be seen in the enlargement, the line that begins at the epsilon first follows the 45 degrees angle of the line screen, then turns left straight upwards in a 90 degree angle along the vertical line and the turns right to follow the 45 degrees angle again. The colour image shows that the real angle is about 60 degrees and that there is no break. Next we have a connection between epsilon and pi, or as Carlson puts it “between the pi and the epsilon”. Also this time the line appear stepped in the b/w image. But there is no pen lift and accordingly no retake. Another obvious illustration comes from the two examples of the abbreviated κυρίου where, according to Carlson, there are “pen lifts between the initial kappa and the final omicron-upsilon ligature”. Right at the centre of both b/w images, where the two letters are connected, the lines are stepped. This Carlson must have taken for a pen stop; that the scribe lifted the pen and began anew a little bit above the stop. As can be seen in the colour images, this is not true but an effect of the line screen not being able to produce the bend. 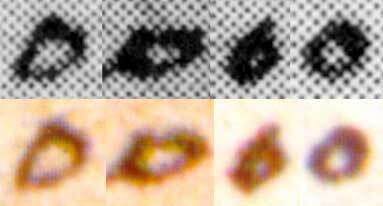 As Carlson actually gives only three examples of retouching, and these are closely connected with the pen lifts (one of the examples is the lambda presented here and which according to Carlson “shows a lot of retouching”), I do not give any such example. Finally there are the forger’s tremors. Carlson writes: “The ‘forger’s tremor’ appears in the shaky quality of lines that should be smooth curves.” But the curves only appear not to be smooth from the low resolution line screen of Carlson’s images. A good example is this theta, where especially the lower part looks shaky, while none of this can be seen in the high resolution colour image. 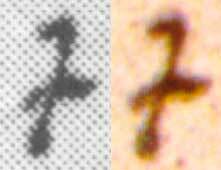 One can see that Carlson’s claim that in “the first line of Theodore, the shakiness is evident in the theta of Θεοδώρῳ” only holds true for the b/w image. Other good examples are the so called squarish omicrons Carlson spotted. He claims that they “are so shakily written as to appear square rather than circular”. All four omicrons which Carlson identified as being square rather than circular are presented here. One can especially look at the omicron furthest to the right, which is quite circular in the colour image, but appears to be a square in the b/w image. The same pair of omicrons are presented also to the left and then magnified even more. This may demonstrate why the b/w images become distorted. These omicrons are really small. In reality they are only about 1 mm in diameter, and the omicron to the right, which is also enlarged to the left, is c. 0.96 mm wide and c. 0.91 mm high. When a small circle is created with these dots, they are mainly following the lines of 45 and 135 degrees angles, forming a square standing on its corner. If one looks at the inner circle in the centre of the omicron, which obviously is quite round, the b/w image composes of only four white squares and the surrounding black dots can then only follow the lines of 45 and 135 degrees angles. The same holds true also for the outer circle. Lines produced at angles which are not following the lines of the dots will appear stepped and could be mistaken for tremors. The long line connecting the omicron-upsilon ligature and the circumflex to the right, where Carlson sees a tremor, is a good example of this. This tremor can only be seen in the b/w image and is due to the fact that the line is bending away from 45 degrees to perhaps 30 degrees. The mu to the right, where Carlson also sees a tremor, is another good example. The tremor in the leg of the mu is prominent in the b/w image compared to the colour image. Also in these two examples of the letter alpha with a smooth breathing, Carlson see tremors in the line which connects the alpha and the smooth breathing. It seems obvious that the stepped lines in the b/w image could be mistaken for tremors. Carlson gives three examples of tremors in the letter rho, and I am reproducing just one of them. Also this time the letter does appear to be shaky in the b/w image, while none of this is visible in the colour image. This somewhat short survey still demonstrates that Carlson’s assertion that the handwriting of Clement’s letter to Theodoros shows signs of ink blobs, pen lifts, retouches and tremors, cannot withhold a critical examination. These signs lie rather in the poor images Carlson used than in the writing itself. The signs of forgery which Carlson claims could be detected in the handwriting cannot really be used as a basis for judgement of the letter’s authenticity, since the quality of the images he used is simply too poor. On the contrary, it can be said that the high resolution colour images do not show any conspicuously marks of ink blobs, pen lifts, retouches and tremors; thereby strengthening the opinion that the text was indeed written rather swiftly. This does in turn strengthen the opinion that the text was written by a skilled scribe in the eighteenth century.